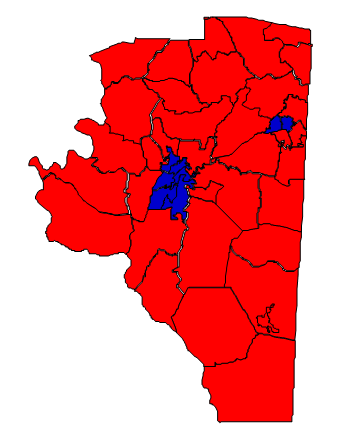 Davidson County is a strongly Republican county located in the Piedmont region of North Carolina. Its county seat is Lexington, famous for Lexington-style barbecue and the Lexington Barbecue Festival, held annually every October. The largest city in the county, however, is Thomasville. The county is renowned for its furniture industry, and the landmark “Big Chair” serves as a monument to it. Forecast: As a fairly populous county (about 150,000+ residents) Davidson is a key county for Republicans who hope to carry the state. There is a treasure trove of conservative voters to be found here. The last candidate to carry Davidson in a presidential race was Franklin D. Roosevelt in 1944. Always a solid Republican county, it has consistently trended to the Republicans since 1996. In a typical year, a Republican presidential candidate can be expected to win Davidson with over 70%. The city of Lexington and parts of Thomasville are strong for Democrats; these areas are where the African American population have its highest concentration. The outlying rural areas are white and Republican. The county growth rate during the 2000s was 10.62%, below the national average and a reflection that the furniture industry isn’t what it used to be. Barring massive demographic change within the county, it is expected to remain solid Republican for a long time to come.